It's seemed like one hell of a wait for Thomas Tantrum's second record. Their self-titled debut came out all the way back in 2008, and with a tour nearly a year ago providing a tantalisting glimpse at the second album breaths have been baited ever since. Luckily, Mad By Moonlight is not only worth the time spent but at times exceeds what we could even have hoped for. 'Sleep' is one of these moments. A terrific piece of pop songcraft which sees the band members pulling in seemingly different directions for the verses before slotting perfectly into place for a magical dancefloor filling chorus. It's only once we segue back into the verses again do we realise how rather odd they sound. That 'Sleep' is paired with Mad By Moonlight's other lead single 'Hot Hot Summer' draws attention to how brilliant Thomas Tantrum are at writing radio friendly singles yet simultaneously ensuring that the album feels front weighted. And that's the only issue with this record that truly prevents it as a piece of work from exceeding it's predecessor. It's all too easy to tune out during 'Turning Blue' and 'On The Phone' especially if the main or only time you get to listen to records at any great length is during that terror of the modern age – the morning commute. Don't get us wrong, these aren't bad tracks – not by any means – all are well written with non-intrusive production, it's just that after the run of incredible singles we've been spoiled and it's hard for these to compare. Hell, for those with more conducive space to listen these tracks could even reveal themselves to be superior. 'Face The Music' has a wonderful eighties chime that Megan Thomas' vocal sways charismatically over in a traditionally pop fashion. This voice is in face the Tantrum's greatest asset elevating even the more passive moments into pretty and sparkling little gems. Contrasting this evolution is 'Cold Gold', the song that's most in line with what we heard on album #1. Spiky and with a pronounced post-punk flavour it's certainly best experienced pulling shapes in the bedroom. That the vocal goes a bit talky at times cements it's place in our hearts and on the tracklisting. Other moments worthy of mention are 'We Are The People' and 'Supermodel'. The first is a cementing of all that makes and has ever made Thomas Tantrum great. Superb musicianship (especially with regards to the drumming) and a tightly wound acerbic jangling artpop performance that make it irresistible. The latter on the other hand sees the band stretch themselves, with softly tapped drums and Megan's jazzy vocal accompanied by a double bass giving off a smoky and sultry air. In lesser hands 'Supermodel' would sound like an indiepop band hitting the button marked 'Jazz' in the studio, in Thomas Tantrum's deft capabilities it's the crowning closer to a superb little pop album. 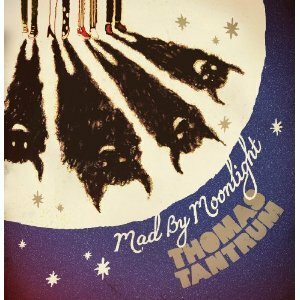 To close, if nothing else Mad By Moonlight gives Thomas Tantrum a shot at the top table of British artpop. When they stretch themselves even further Kate Jackson will have to look over her shoulder and at the rate they're going this isn't a far fetched prospect.